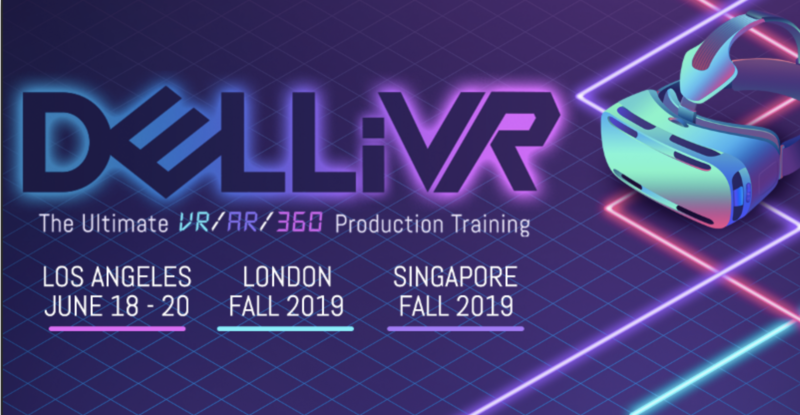 NEW YORK, NY (January 24, 2019) – Future Media Concepts announces today the DELLiVR Conference, a three-day training event held in three locations: Los Angeles, CA (June 18 - 20, 2019), London (Fall 2019) and Singapore (Fall 2019). The conference is produced in collaboration with major industry vendors, including with Dell, Adobe, and HowToCreateVR.com. The conference agenda consists of multiple tracks featuring keynotes, a 2-day 360 video production field workshop, another 2-day VR and AR hands-on workshop, case studies and best practices by industry visionaries, and an expo night where attendees will have a chance to immerse themselves in VR experiences. As immersive media becomes increasingly important for a growing number of fields, so does the need for qualified professionals who can help organizations integrate VR into their workflow. DELLiVR is the only industry event where attendees can get hands-on training from industry experts. Gary is the Director of VR/AR globally at Dell Inc.
Amy DeLouise, Director/Producer of DeLouise Enterprises, LLC, who will be leading on case studies by VR industry visionaries. Workshop Pass priced at $695. Each of the conference pass options gives attendees access to keynotes, program sessions, introductory workshops, Expo, and VR games. To learn more about this conference, visit www.dellivrconference.com. Established in 1994, Future Media Concepts (FMC) is the nation’s premier digital media training organization providing manufacturer-authorized training in digital video and film editing, motion graphics, web design and development, sound design, 3D animation, desktop publishing, architectural and mechanical design, Mac IT, and mobile apps development. Future Media Concepts is a leading producer of education-rich conferences, many of which take place at today’s leading electronic entertainment trade shows. Some of our events include Editors Retreat , Adobe Video World, and Post|Production World at NAB Show in Las Vegas, New York and Shanghai. For a complete list of conferences, click here.